Sciblogs | Human evolution – how do we accommodate new discoveries in our teaching? Human evolution – how do we accommodate new discoveries in our teaching? What follows is loosely based on a workshop I ran at this year’s Biolive/ChemEd secondary science teachers’ conference. (A most excellent conference, by the way – kudos to those organising & presenting.) I’ve added a bunch of hotlinked references. Back when I was in 7th form (or year 13 – i.e. a rather long time ago), the description of human evolution we learned about in biology was essentially a very linear model – and it began with Ramapithecus, dated to around 14 million years ago. Even when I began teaching the subject in secondary school bio classes, the curriculum information still had that linearity: the probable tree went something like Australopithecus africanus → Homo habilis → Homo erectus → Homo sapiens. From memory, the Neandertals were in there as ancestral to our own species, whereas these days they are generally viewed as a sister speciesA. Now, of course, we know that our family tree is much more complex than that, albeit quite heavily pruned in recent geological times, and with a more recent origin for the last common ancestor of hominins and chimpanzees. This knowledge has been informed by both a range of new fossil finds, and ongoing ancient DNA (aDNA) analyses. For example, with the discovery of Homo floresiensis remains (Brown et al, 2004), we had a not-too-distant relative living into our not-so-distant past. And DNA analyses first resulted in the publication of a Neandertal genome (Green et al., 2010), and then in the recognition of interbreeding between Neandertals, sapiens, and another species (the Denisovans), that helped extend our understanding of patterns of migrationB. Family tree of the four groups of early humans living in Eurasia 50,000 years ago and the gene flow between the groups due to interbreeding. From news.berkeley.edu. An international team of researchers say the findings entirely change the beginning of human history and place the last common ancestor of both chimps and humans – the so-called Missing Link – in the Mediterranean region. Except they didn’t. The authors of the actual paper say only that the fossils have “a possible phylogenetic affinity with hominins” (Fuss, Spassov, Begun & Bohme, 2017). But then, that doesn’t make such a good headline, does it? Bear in mind, too, that the remains they describe are very fragmentary indeed – a mandible with some permanent teeth, and (possibly) a premolarC – and that they come from two separate geographic locations, Greece and Bulgaria respectively, so the ‘reconstruction’ that accompanied the story was entirely imaginary. Incidentally, the analysis is new, but the fossils themselves were found quite some time ago – the mandible was unearthed in 1944. … we have constrained the depositional age of Homo naledi to a period between 236 ka and 335 ka. These age results demonstrate that a morphologically primitive hominin, Homo naledi, survived into the later parts of the Pleistocene in Africa, and indicate a much younger age for the … fossils than have previously been hypothesised on their morphology. Homo naledi stood about 150cm tall fully grown and weighed about 45kg. But it is extraordinary for its mixture of ancient and modern features. It has a small brain and curved fingers that are well-adapted for climbing, but the wrists, hands, legs and feet are more like those found on Neandertals or modern humans. If the dating is accurate, Homo naledi may have emerged in Africa about two million years ago but held on to some of its more ancient features even as modern humans evolved. It is now evident that a diversity of hominin lineages existed in this region, with some divergent lineages contributing DNA to living humans and at least H.naledi representing a survivor from the earliest stages of diversification within Homo. The existence of a diverse array of hominins in subequatorial [Africa] comports well with our present knowledge of diversity across other savanna-adapted species, as well as with palaeoclimate and palaeoenvironmental data. In other words, everything we know about species diversity in this particular environment predicts that our lineage should be similarly diverse; it shouldn’t be a surprise. By the way, that Guardian article comes with some excellent illustrations, by the way: images of fossils, and diagrams of the cave in which they were found (which is a great story in itself). 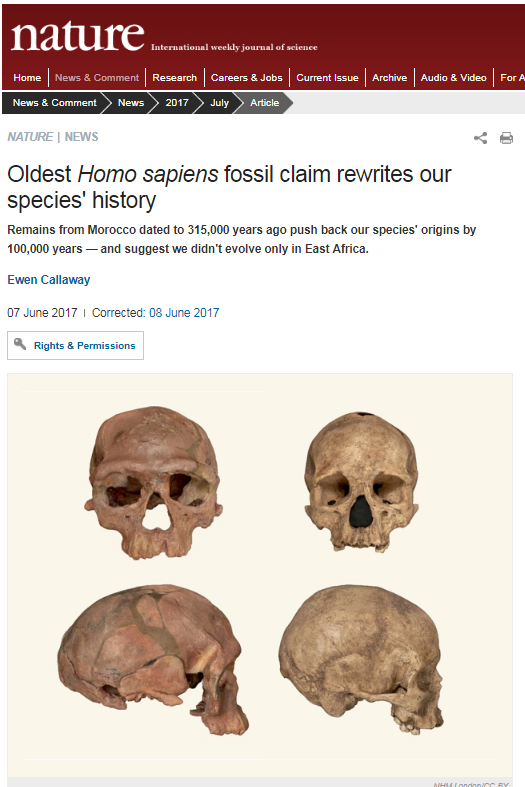 And then another headline: “Oldest Homo sapiens fossil claim rewrites our species’ history“. I know the headlines attract reader interest, but we see so many like this, and they really are misleading. What this particular paper has done is extend our understanding of the possible duration of our species’ existence, but it doesn’t ‘rewrite’ things: it pushes back our origins, and also suggests that early sapiens either ranged much further than scientists had previously thought, or didn’t evolve solely in East Africa. These particular fossils were discovered back in the late 20th century, when they were estimated at around 40,000 years old. The much older dates come from analysis of the sediments they’re found in. However, it’s worth noting (and is reported in the story at the above link) that not everyone agrees with this analysis. 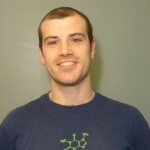 Palaeontologist Jeffrey Schwartz, at the University of Pittsburgh, Pennsylvania, says the new finds are important – but he is not convinced that they should be considered H.sapiens. Too many different-looking fossils have been lumped together under the species, he thinks, complicating efforts to interpret new fossils and to come up with scenarios on how, when and where our species emerged. “Homo sapiens, despite being so well known, was a species without a past until now,” says Maria Martinon-Torres, a palaeoanthropologist at University College London, noting the scarcity of fossils linked to human origins in Africa. But the lack of features that, she says, define our species – such as a prominent chin and forehead – convince her that the Jebel Irhoud remains should not be considered H.sapiens. I think there are some great ‘teachable moments’ here, in incorporating this new information into classroom teaching. The first relates to the nature of science – it isn’t fixed, and new data may lead to changes in our understanding (this both makes science a constant adventure, and also contributes to some public mistrust around science – ‘how can we trust those scientists when they keep changing their story?’.) The second is that evolution’s not a linear, directional process, and the hominin family tree demonstrates this rather well. And the third is that evolution may result in a mosaic of features, as we see with naledi. What evolutionary theory predicted was that humans must have evolved from something, and morphologically the great apes are closest to us. So, we should find species that fill in the morphological space between humans and great apes. Further, they should occur in a geological and temporal pattern that makes sense evolutionarily. Finally, when we date the last common ancestor by genetic analysis and fossil analysis, they should roughly fit. All of these predictions are true. Evolutionary theory was fantastically successful in that regard – we are finding a whole host of hominid species that are part-way between apes and humans. A As you might imagine, we had an interesting discussion around what ‘species’ even means in this context. A rigid application of the biological species concept would preclude neanderthalensis and sapiens being sister species, after all, given the increasing evidence of interbreeding between the two. Of course, further back in the fossil record (beyond the point where useable DNA can be retrieved), we have to rely on morphological characteristics only – an approach that’s fraught with difficulties. There’s this example in the pachycephalosaur dinosaurs, for example. And the NZ moa – once aDNA techniques made the analysis possible, scientists found that what we thought were something like 22 different species were 11 strongly sexually dimorphic species (large female, small male). C As a total aside, back in 1922 there was a flurry of excitement when Henry Fairfield Osborn used a single tooth to posit the existence of “Nebraska Man”, supposedly a 10-million-year-old human ancestor, as a means of showing that human evolution was a thing (and that it had happened in the US). He was wrong. I Sample (2017) New haul of Homo naledi bones sheds surprising light on human evolution. https://www.theguardian.com/science/2017/may/09/new-haul-of-homo-naledi-bones-sheds-surprising-light-on-human-evolution. The Guardian. Featured image: LES1 cranium from Homo naledi. Credit: John Hawks, Marina Elliott, Peter Schmid et al./ Wikimedia. Please don’t use that progression picture you have at the top of the article. The leftmost ancestor also went on to evolve into Chimpanzees and Bonobos, both of which are advanced species, well fitted to their environment. By using that picture you reinforce the notion, that some people have, that man is the highest endpoint of evolution. However, the bush diagram from Berkeley gives a good picture of what appears to have happened, with several varieties of human or hominin inter-breeding over time. The bush got bushier just a couple of weeks ago, in fact ( http://www.buffalo.edu/news/releases/2017/07/028.html ) and there will no doubt be further discoveries, which is an important thing to emphasise to students. This is an exciting area to watch. A fair point Ross. The image was added by me on the Sciblogs end (not by Alison as she points out below) fully aware of its erroneous nature. It was intended to highlight of how our understanding of evolution has changed. However without reading the article that context might be lost. I have replaced it with an image of a Homo naledi skull. The original post doesn’t have that image – it was added by sciblogs & I’ll ask that it be changed. Thanks, John, very much appreciated. Thank you. I think this strengthens a very good post.